This chapter presents a political economic analysis of the privatization movement in Turkey. In terms of pace and volume, the privatization experience in Turkey can be examined in two different periods. In the period 1985–2003, privatization amounted to only 8.2 billion dollar, while it reached approximately 36.4 billion dollar in the period 2004–2009. The radical transformation in the privatization policies of Turkey is worth analyzing from a political economy perspective. To this purpose, first, the historical background to privatization in Turkey and the circumstances leading to liberalization and privatization policies will be examined. Second, the factors influencing the privatization process such as objectives, strategies, and the effects of economic, legal, institutional, and political conditions will be discussed. 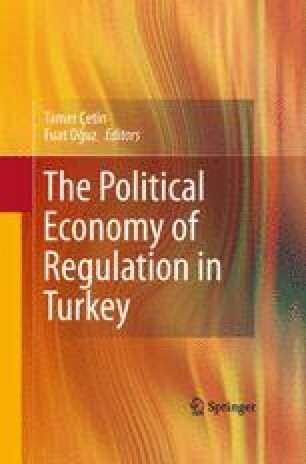 Analysis of the privatization experience in Turkey reveals that factors such as legal and institutional structures, political will, unstable macroeconomic conditions, ideological resistance, and rent seeking activities shaped the privatization movement and its consequences. Börner, K. (2004). The political economy of privatization: Why do governments want reforms? Discussion Paper No. 2004-1. Department of Economics University of Munich. http://epub.ub.uni-muenchen.de/296/1/PrivatizationPaperDiskussionJan04.pdf. Accessed 25 May 2010. Bortolotti, B. & Pinotti, P. (2003). The political economy of privatization. Research Paper Series No. 45.2003. Fondazione Eni Enrico Mattei. http://papers.ssrn.com/sol3/papers.cfm?abstract_id=418020. Accessed 25 May 2010. Hemming, R. & Mansoor, A. M. (1988). Privatization and public enterprises. IMF. http://ssrn.com/abstract=884559. Accessed 25 May 2010. PA. (2010). Privatization endeavor in Turkey. Republic of Turkey Prime Ministry Privatization Administration. http://www.oib.gov.tr/yayinlar/publications.htm. Accessed 25 May 2010. Pamuk, O. (2007). Economic change in twentieth century Turkey: Is the glass more than half full? Working Paper No. 41. The American University of Paris. http://www.aup.edu/pdf/WPSeries/AUP_wp41-Pamuk.pdf. Accessed 25 May 2010. Shirley, M. M. & Walsh, P. (2000). Public versus private ownership: The current state of the debate. Working Papers No. 2420. World Bank. http://www-wds.worldbank.org/servlet/WDSContentServer/WDSP/IB/2000/09/15/000094946_00090605460293/Rendered/PDF/multi_page.pdf. Accessed 25 May 2010. Tansel, A. (2002). The effects of privatization on labor in Turkey. Working Paper No. 2002-5. METU Economic Research Center. http://papers.ssrn.com/sol3/papers.cfm?abstract_id=303440. Accessed 25 May 2010. UNESCAP. (2001). Privatization: A panacea or a palliative. Development Papers No. 22. The United Nations Economic and Social Commission for Asia and the Pacific. http://www.­unescap.org/drpad/publication/toc/dp22con.htm. Accessed 25 May 2010. World Bank. (2008). Turkey country economic memorandum-Volume II. World Bank Publication. http://siteresources.worldbank.org/TURKEYEXTN/Resources/361711-1209153236622/Volume_II_Final.pdf. Accessed 25 May 2010.